Many Marketers have expressed gratitude to the Marketing Consigliere for recently putting together a short but sweet list of serious B2B Marketing Automation iphone apps in Snap! B2B iPhone Apps! Part I and Part II. Part of the reason he did this was because he could not find a decent list and was dissatisfied with how the AppStore was organized. And when he was running the B2B Twitterer of the Year Awards this year, he wanted to be able to see what applications might be out there to help analyze the nominees. Fortunately someone has done a great job organizing the various apps for Twitter. oneforty is what the AppStore should be. Started last year, it serves as a clearinghouse and marketplace for the various apps that enhance the Twitter-based social networking experience, and more importantly, give true value to businesses. In an authentic social media fashion, oneforty organizes the apps and provides an explanation of what the app is for, crisp screenshots, and of course, user generated reviews. By integrating oneforty’s backoffice platform, developers can make their applications available to the public. Naturally, oneforty gets a well-deserved cut. Currently there are about 125 apps available for purchase; and hundreds of others. Categories of interest to businesses include advertising, analytics, automation, mobile, monitoring, and productivity. 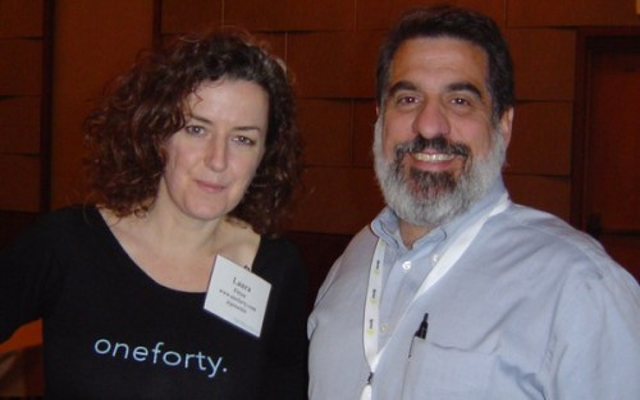 oneforty is a great place to go to learn about what Twitter is capable of doing for you as an individual consumer (there are some fun apps), but more importantly, as a business. SMBs should especially make it a point to visit it because there maybe some free apps that can save them a lot of headache. Interesting note: the CEO of oneforty was one of the first people that The Marketing Consigliere started following outside of his circles in the Washington, DC area. And it happened on a whim because he liked her Twitter handle, even though he knew niente about her. Her name? Laura Fitton (@Pistachio). Pistachio is his favorite gelato flavor and he never turns down the chance to enjoy it; it’s simply irresistible. That’s why last Fall at TWTRCON DC he had to get his picture taken with her. The Marketing Consigliere’s beard may now be gone, but his impression of the brief meeting with Laura Fitton is still warm and fuzzy! She is simpatica and a terrific speaker so if you get the chance to hear her, go. She is an integral part of the Net-Centric Marketing world.